← FCC Brendan Carr to Use “ALEC” 5G Bill for Upcoming FCC Wireless Debacle; 25 Years of AT&T Vaporware to Rural Areas Revealed in Indiana. 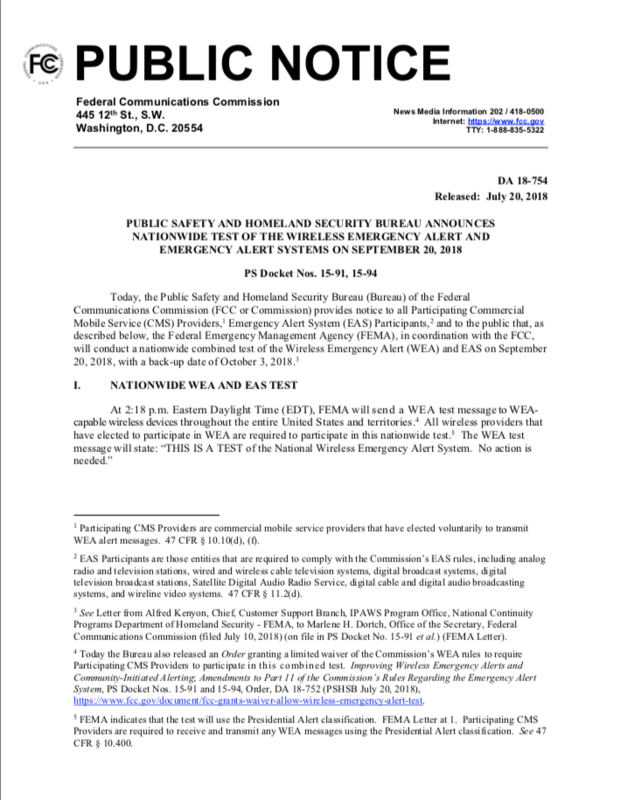 We invite members of the public and interested stakeholder organizations that are in a position to observe test results in their communities to provide feedback on the test, including any problems observed or any other complications in the delivery of the WEA or EAS test message during the nationwide test, by reporting their observations to the Public Safety Support Center at https://www.fcc.gov/general/public-safety-support-center. For further information regarding the nationwide test, contact Gregory Cooke, Deputy Chief, Policy and Licensing Division, Public Safety and Homeland Security Bureau, at (202) 418-2351 or gregory.cooke@fcc.gov, or Linda Pintro, Attorney Advisor, Policy and Licensing Division, Public Safety and Homeland Security Bureau, at (202) 418-7490 or linda.pintro@fcc.gov.